The northwestern aspect of Cannon Mountain isn’t much to look at. The lower slopes have been logged and are pocked by landslides. The mid-level and upper slopes have been burned, turning the old stands of lodgepole pines into glades of charred whiskers. Take all this in from below and you can’t help thinking that the area is a disaster of human and natural abuse. Ski tourers, however, sometimes see terrain differently. Rather than seeing slashed forests, they see clearings for carving. 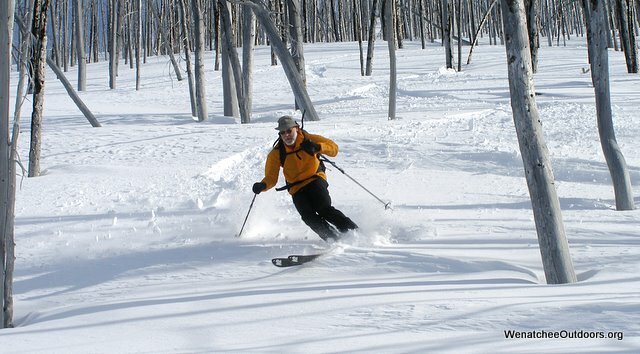 Rather than seeing torched glades, they see canopy-free slalom runs. Beauty as seen by a photographer and a skier are sometimes different animals. On this April weekend these slopes provide another benefit to the two of us who arrive to ski: Safety. 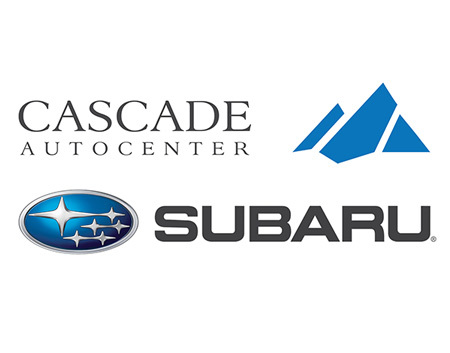 The Cascade crest has been hammered with two feet of snow in the past week and high avalanche danger dampens our enthusiasm for skiing there. These slopes, however, are far enough east to have received about half the snow. And then there’s the matter of aspect. 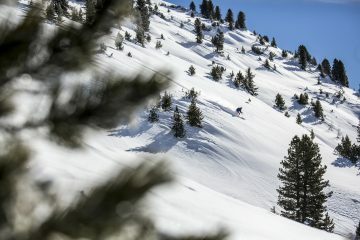 With their northern exposure, these slopes still have snow stretching down to the 3,000 foot level while nearby western and southern aspects have snow levels of 4,700 and 5,300 feet respectively. All of this factors into why we are walking and then skiing up the Eightmile Road on an April Sunday. At the 3,000-foot level we leave the road and boulder- hop across Eightmile Creek. Then for the next 5 hours we climb the relentlessly steady slopes leading to the 7,800-foot level where the north ridge is bifurcated by the Cannon Mountain Couloir into two prongs. Photo Right: Just above the creek crossing at the 3000-foot level. Later in spring, high runoff can make this crossing dangerous. 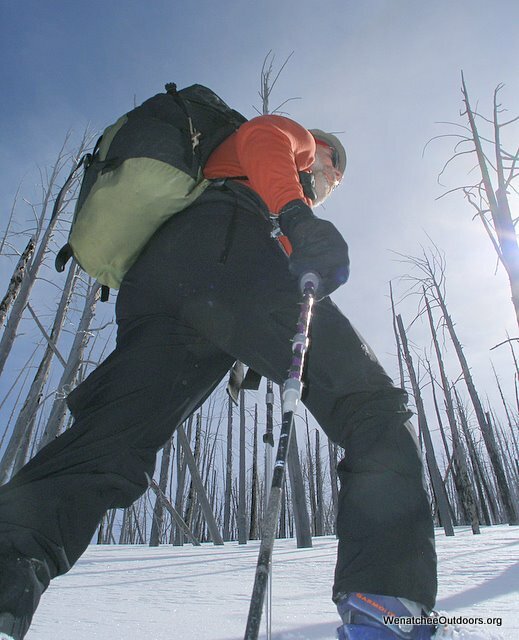 Even to skiers, the initial part of the climb is an Ugly Betty—it’s an open-pit mine stripped of its carbon ore. About a third of the way up, our climb moves from fields of stumps and fallen logs into burnt glades. Suddenly we are touring through a zebra-scape where the stripes of black shadows and charred trees contrast severely against white snow. The fire-pruned trees also yield hidden views of the surroundings peaks – Eightmile Mountain, Mount Stuart, Cashmere Mountain, Glacier Peak. After several hours of truly beautiful uphill touring we intersect the North Ridge and the entrance to the Cannon Mountain Couloir—one of those objectives on the Bucket List of many local skiers. The accounts of old telemarkers who once attacked this slot on flimsy skinny skis sometimes puts the top 400 vertical feet at a steepness greater than 45-degrees. 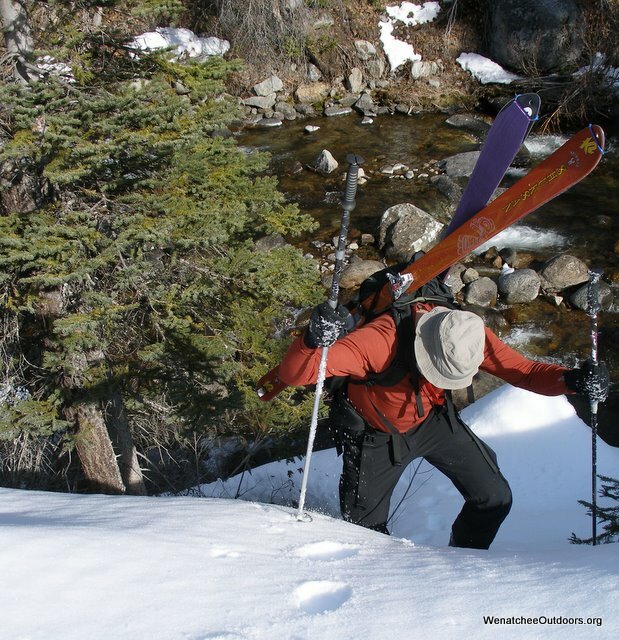 Modern skiers with sturdy gear will more realistically place the pitch closer to 40 degrees. We’re tempted to ski the couloir but today the entrance slopes are wind affected and second rate next to powder in the burns. We point the skis down a line paralleling the ascent route and, for nearly 2,500 vertical feet, ski a slalom course marked with black poles and coated with powder. The quality of snow, quality of light, and quality of views make it a line to remember. Lower down, we squirt out of the glades into clear-cuts catching more sun. Fortunately the sunlight is oblique and has alchemized the snow to corn rather than tapioca. For another 2,500 vertical feet, we carve between tree stumps, around the sprigs of vine maple, and over the humps of fallen logs. Yin and Yang coexist on these slopes–what was a superfund site by morning is a super-fun slope by afternoon. See a slideshow of this tour. 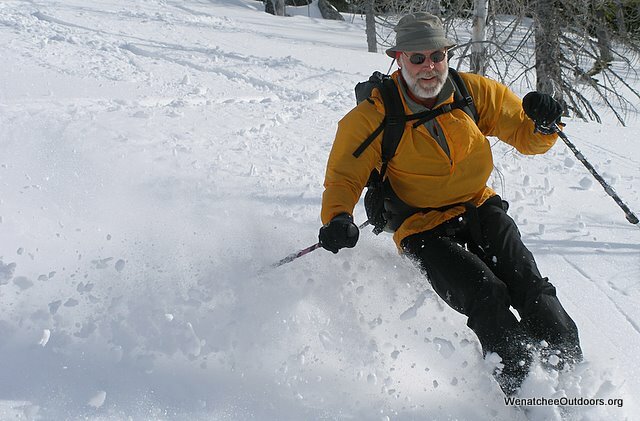 Activities: Ski Touring and Snowshoeing. Elevation Gain: 5,800 vertical feet. Skill level: 2+ to 3 (strong intermediate to advanced). Access. 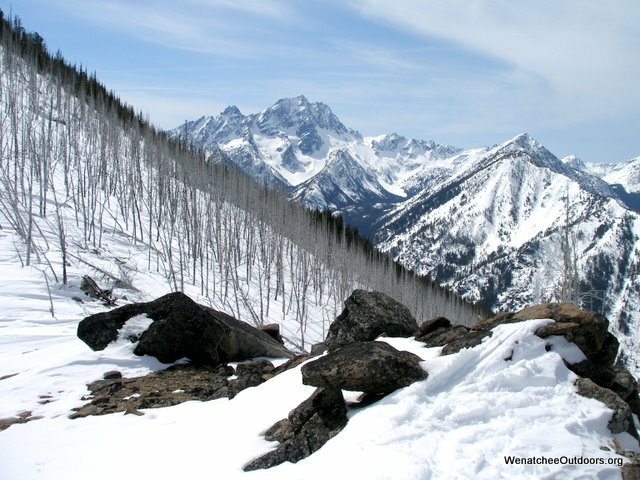 From Leavenworth, follow the Icicle River Road about 6 miles beyond the Sleeping Lady Resort. Park at the Bridge Creek Campground or at the end of plowing just past the Bridge Creek Campground (elevation 2,080’). No permits are needed in winter. Follow the Eightmile Road (FS Road 7601), which intersect the Icicle River Road at Bridge Creek. Cross Icicle Creek and head uphill for 2.25 miles. At the 3,000 foot level you are nearly adjacent to Eightmile Creek and can access the creek easily. Leave the road and find a place to cross. We boulder- hopped across. During the spring melt, you may need to cross on a fallen tree. Finding a log that’s not scary skinny may take some searching. From the far side of the creek, head in a southerly direction up to the start of Cannon Mountain Couloir (el 7,800’). 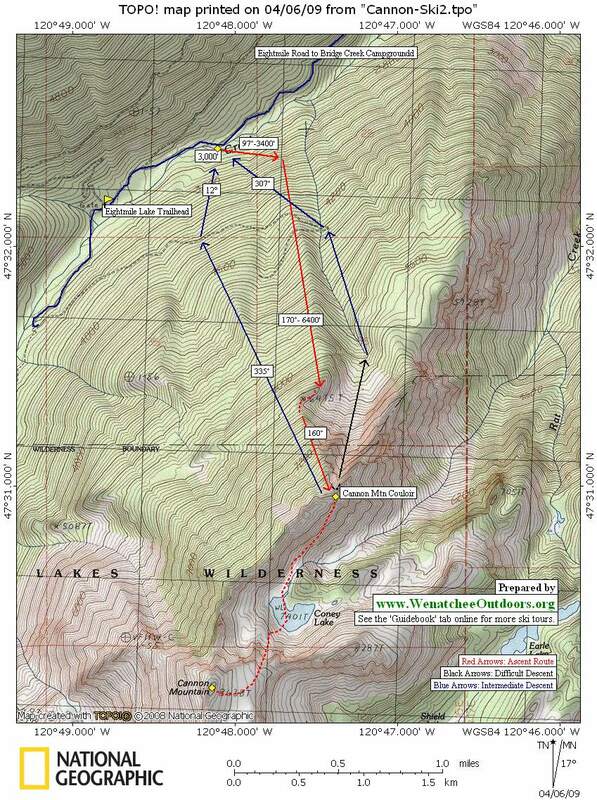 Our topo map below shows one of many ascent possibilities. The northwest slopes offer many descent routes. 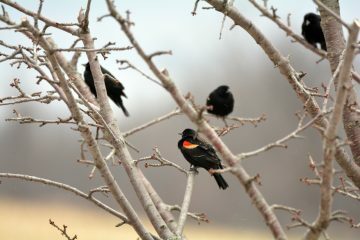 A few are shown on our map. Many variations exist but a poorly chosen line may tangle you up in the blues of a land slide. If you ski the couloir, enter about 100 feet down from its top and contour in from skier’s left. Maps. Print our topo map on 8.5”x11” paper in portrait mode. Note: Use ‘Print Preview’ to properly orient and scale this map before printing. Hazards. Avalanches can certainly sweep down these slopes, but the angle (low 30 degrees), anchors, lower snow quantities, and wind protection all contribute in making these slopes moderately safe. The more persistent danger is a collision of the woody kind. Permits. None required before the Eightmile Road opens for the summer. If you try to ski this after the Eightmile Road opens in the late spring, you will need a Northwest Forest Pass to park at the Eightmile Lake Trailhead.